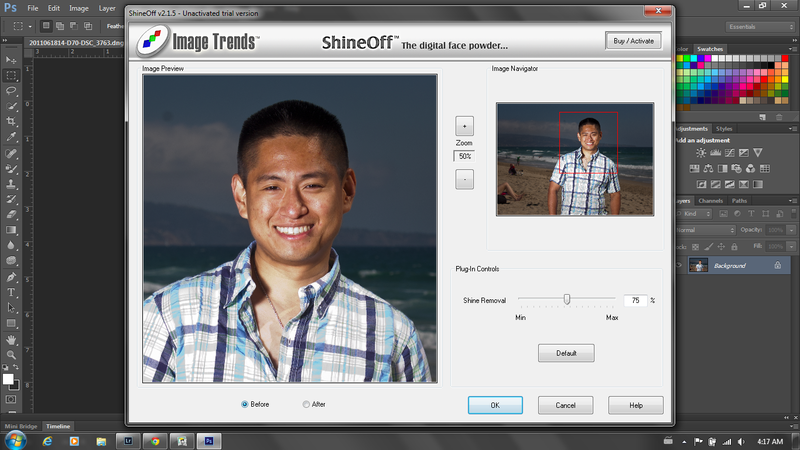 ImageTrends ShineOff is one of my favorite Photoshop plugins. It removes specular reflections (shine) from a face which can be caused by sweat or oil. Removing this shine is important to me because it looks more flattering and reduced specularity gives the illusion that a softer light source was used. The interface is pretty simple. Just zoom in to any portion of the image, and adjust the strength of the effect. That's all there is to it. 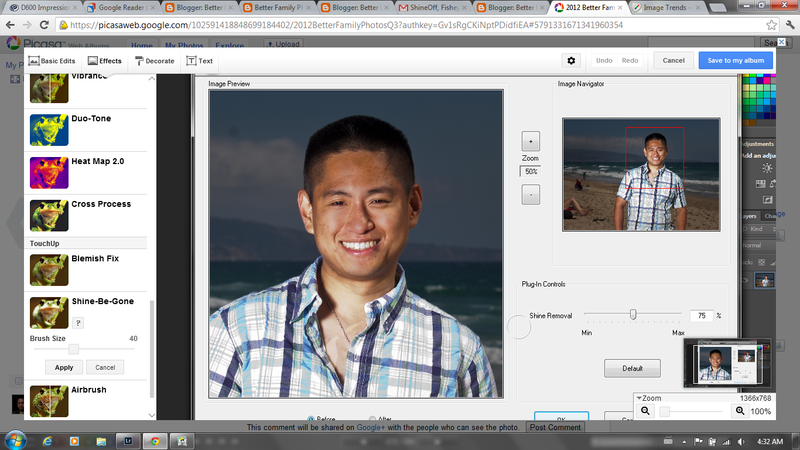 The only other product that I know of that does something like this is Picnik's Shine-Be-Gone. 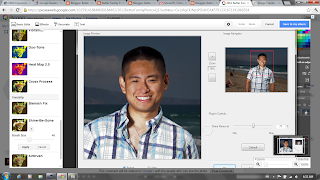 Picnik is itself now gone :) but many of its features are now part of Picasa's Creative Kit. As you can see, Shine-Be-Gone has a similar effect. You do have to manually click on all the reflections that you want to remove, so it's more tedious but arguably offers more control. On the other hand, if you click on something by mistake, you can't undo just that one click. You have to cancel and re-do the adjustments. The good news with Shine-Be-Gone is that it's free (and so is the use of Creative Kit). The not so good part is that it can't edit the image from your hard drive. Instead, you have to upload your image, edit it, then re-save it. Besides ShineOff and Shine-Be-Gone, it is possible to use the spot healing brush in many editors to try to do the same thing. But I find this very tedious. There's another ImageTrends product I'm sort of interested in - the Fisheye Hemi plug-in but so far I haven't been able to produce results that improve the image, or that is any better than the Adaptive Wide Angle filter of CS6. Anyway I'll post about those comparisons next time.